I really love the artwork from this period. 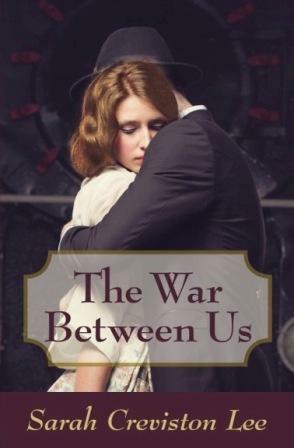 Isn't this cover art great? One neat thing about this cookbook is this information about bananas. I normally don't pay much attention to how a banana looks. I know if it's too green it tastes dry, hard, and sour and if it's too brown it tastes sickly sweet and mushy. 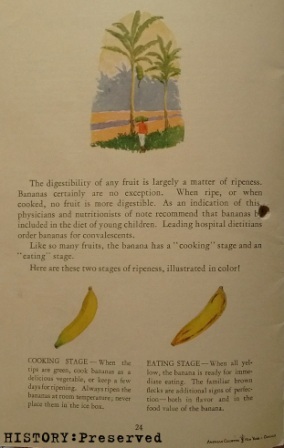 So, I eat it somewhere in between those stages of a banana's ripeness. I found this information in the above picture to be quite enlightening! I love that they say when the tips of the banana are green you can use it as a vegetable. 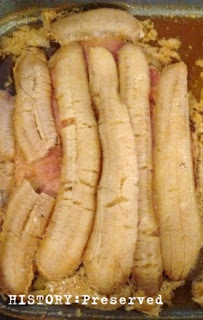 And if the banana is all yellow with a few spots of brown, you can use it in a dessert. It's a great guide! So, here's the recipe. It actually, seriously, doesn't sound that bad. When I saw the mustard and brown sugar, I thought, Yeah! I can do this! 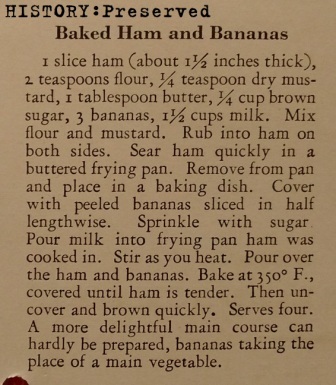 It sounds like a typical ham recipe. 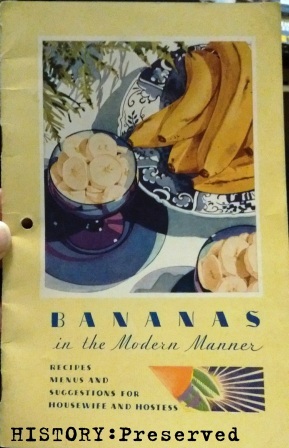 With the addition of bananas. Below is the picture of the dish before baking. I was happy to get two thick ham steaks from the local meat locker. I needed two, because if the one with bananas didn't turn out, I didn't want my family to starve! haha! I honestly have no idea what the milk was for in this recipe. 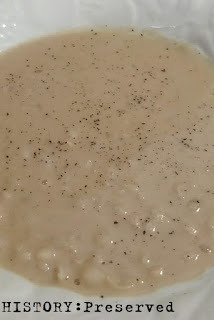 I thought it, maybe, served to tenderize the meat a little, but it doesn't marinate in the milk. You put it in the oven right away. And then the milk cooks and the broth clarifies, leaving clumps of cooked milk everywhere. Weird! As you can see - milk clumps in with the juices. Hmm. And the star of the show - Baked Ham & Bananas! I'm not going to lie. It looked really gross. 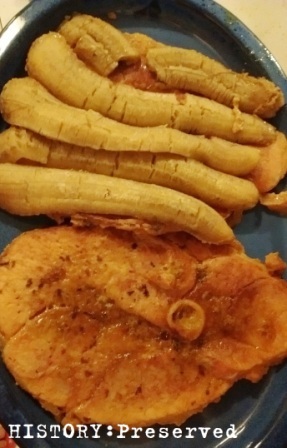 The bananas had swollen to an unappetizing size and texture. Put on a platter, the dish looked better than it did in the baking pan. As soon as we sat down,though, my kids promptly made me aware of which ham they weren't going to try. Ha! Keep in mind that I had invited my mom over to share our Mother's Day meal. Luckily, she was pretty game! 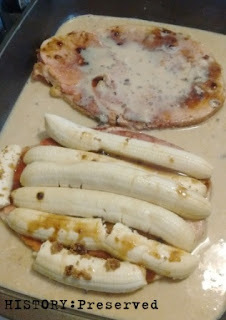 I had to take a deep breath before trying a bite of the ham and bananas. And you know what? It actually wasn't that bad. The texture of the banana was surprisingly still solid (meaning it wasn't a falling apart mush) and the taste at the beginning made me think ham & pineapple until the end when it definitely tasted like a slightly under ripe banana. Hmm. 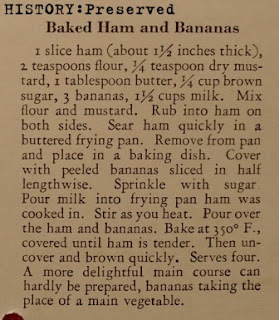 The biggest, most surprising thing about this recipe is that the ham covered in banana was far more tender and juicy than the one without. It was great to have a comparison! 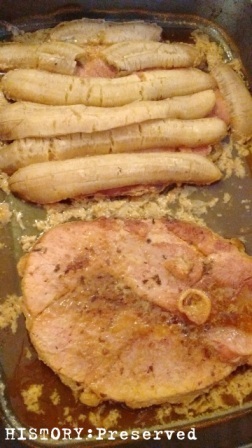 My mom even said she liked how the banana kept the ham moist. The take-away from all this is that ham and bananas still don't go together no matter what decade you're in. (At least in my book. To each his own!) 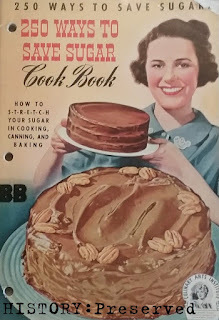 I didn't hate this recipe, but I wouldn't make it again. 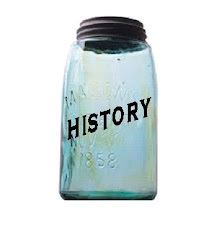 There really are some things that are better left in the past!